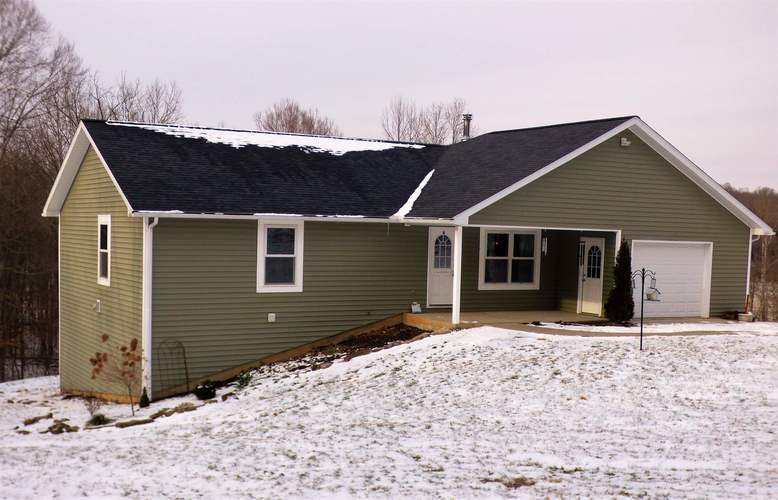 NEWER EFFICIENT HOME ON 26 ACRES near I-64. Great open floor plan w/custom cabinets, walk-in pantry and center island w/custom built barstools. Dining room opens onto deck w/spectacular views of valley. Full, walk-out basement, mostly finished w/full bath. Add another bedroom by simply adding a closet in guest room/office. Laundry room w/1/2 bath. Unique cook/heat Waterford stove imported from Ireland is a solid alternative or supplemental heat source and negotiable. Geothermal furnace heats water as well as efficiently heats and cools home and lots of natural light for low electric bills. 36" doorways. Attached garage, large stones from property in landscaping, woods, chicken coop, stream running through property and much more makes this the unique property you have been waiting for. You can also negotiate to add in the gas range, refrigerator, washer and dryer, '97 4x4 Chevy truck and a Kubota tractor and accessories. Directions:Birdseye: IN-145 S. 2 mi turn L on E. Borden Hill Rd. 1.7 mi slight L on W. Oak Hill Rd. .9 mi turn R on Sigler Creek Rd. Home is 1.3 mile on right.Ferdinand: L onto I-64 E exit 72 R on IN-145, L on IN-62, L on Cloverdale Rd. Home on L.